Inside a colourful shop, some young men and women create a tasty magic we all won’t even try to resist – candy! At Sticky Cambodia, there’s always a sweet delight for kids and kids at heart. Located at the ground floor of Aeon Mall, Sticky Cambodia is a go-to place for everyone who wants to get a taste of handmade candies or see with their own eyes how candies are made. The shop has been a fixture in the mall for several years now. 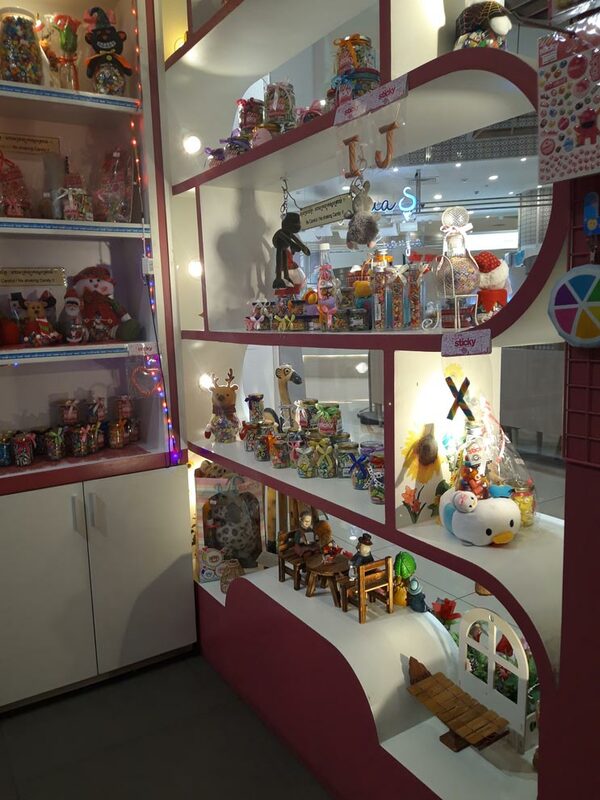 “This shop is the first handmade candy shop in Cambodia. We have two shops in Phnom Penh. 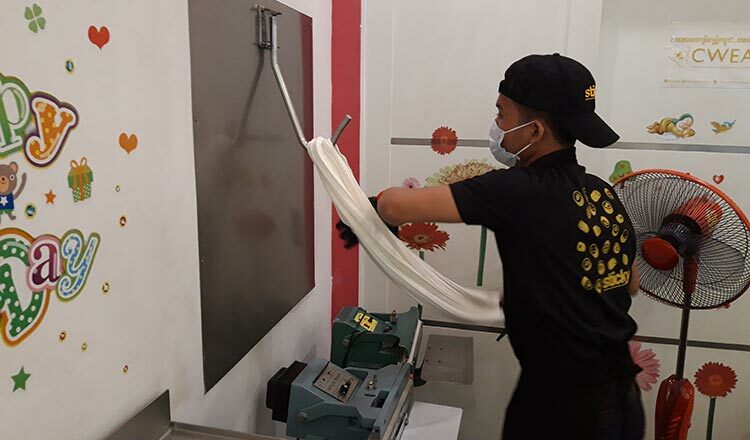 This brand is originally founded by an Australian,” shared Chea Phallyka, the 36-year-old owner of Sticky Cambodia. She added that the shop has been running since 2013. It is really the objective of Sticky Cambodia to show people – buyers or just curious onlookers – how the most loved sweet treats are made. Through a glass panel, people can see staff molding, pressing and putting flavours to the mixture until it becomes rock candy. 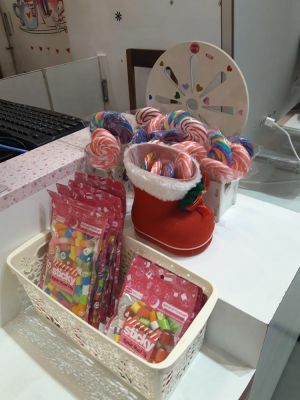 The shop also offers free candies to those who want to take a bite. Making candy isn’t really as sweet as it tastes. It undergoes a thorough process to achieve perfect flavour. 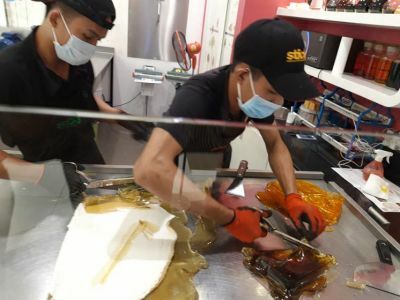 Phallyka said that most of her staff are around 19 to 23 years old – all of them trained to make candies, market the product and deliver only top quality service. Chea Chantha, for one, is one of the candy makers in Sticky Cambodia. 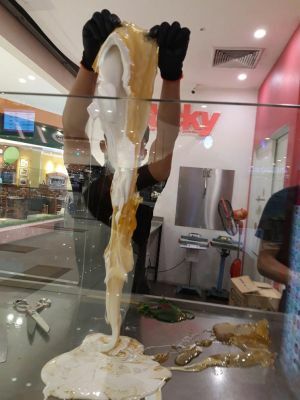 The 23-year-old said he trained for one year before he finally perfected the rock candy. His expertise in creating an awesome treat with his hands has been one of the shop’s greatest crowd-puller. delicious candies for customers,” Chantha shared as he added different flavours to a sugar mixture he boiled for 50 minutes. 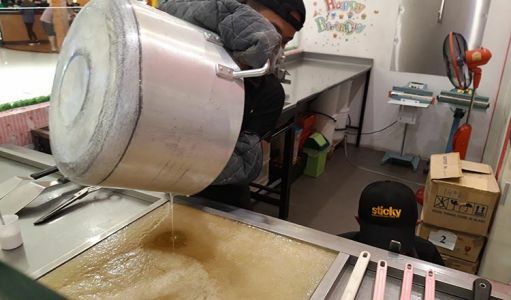 “After boiling the sugar, we mix the other ingredients to add flavour and color to the candy. There are three layers to be rolled. For now, we’re doing pineapple candy. We mix the green and yellow colouring. The last colour, which is white, is a covering to make all the ingredients stick out with each other. 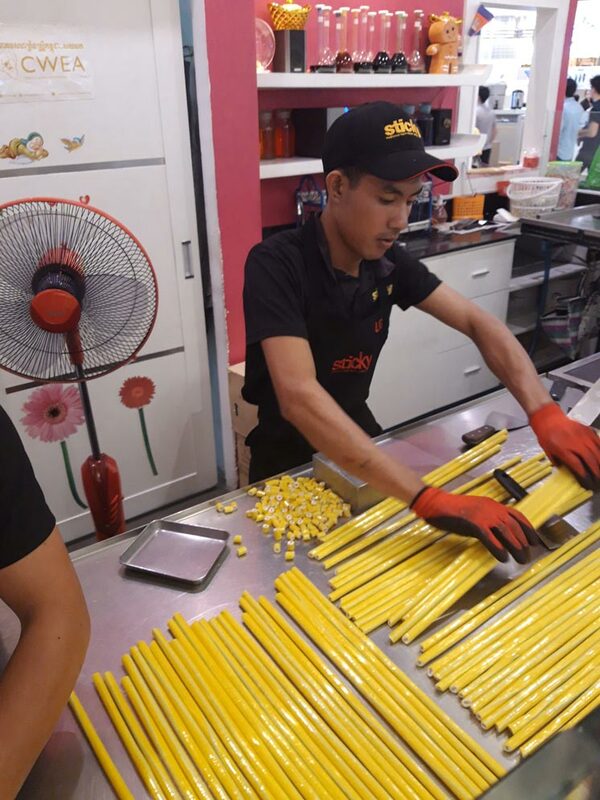 “After we check that all colours have been placed beautifully, we chop and cut them in different sizes and then pack them into plastic bags,” said Chatha. 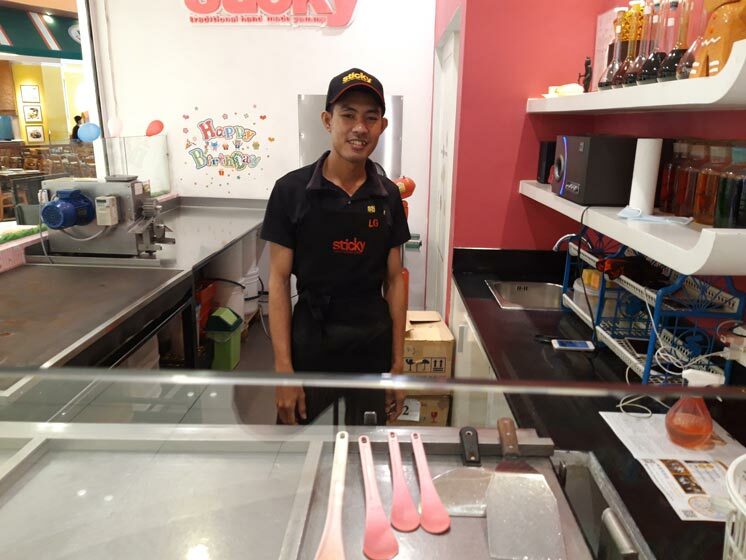 He added that all the staff at Sticky Cambodia are required to always wear apron, gloves and mask to ensure sanitation inside the shop. 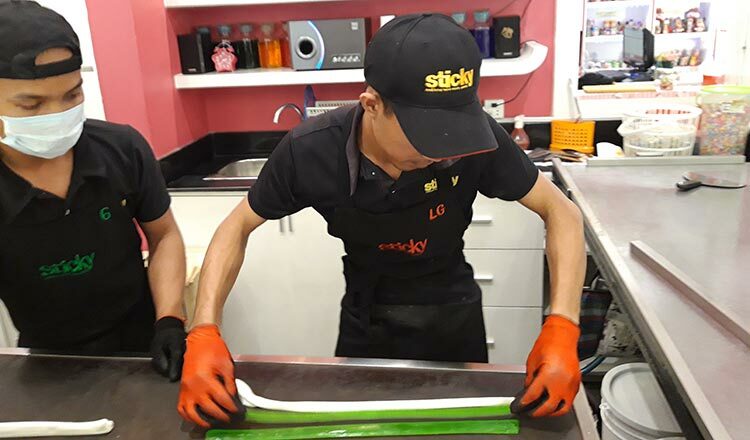 Because aside from top quality products that everyone will surely can’t get enough of, Sticky Cambodia also upholds cleanliness and professional inside their store. 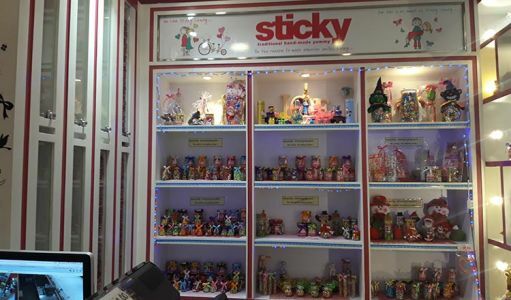 For all candy lovers, Sticky Cambodia sells different kinds of flavours and styles in different packaging with prices starting from USD1, depending on the size.